As a resident of defiantly blue-state New Jersey, I say it’s about damned time those “takers” in the bright-red states of the Deep South and Mountain West got what was coming to them. They say only Nixon can go to China, and so it must be that only Mitt Romney can take on the true enemies of real Americans by serving up some painful truths to GOP-voting America. When Mitt Romney talks about “takers” voting themselves more and more free benefits without paying anything into the system, we all know who he’s talking about. He’s talking about all those old people in Florida, checking in for free hip replacement surgeries they probably don’t even need (courtesy of Uncle Sam!) before going back home to work on the ObamaCare is Socialism! banner they’ll be carrying at the Tea Party demonstration on Tuesday. He’s talking about those libertarian farmers in Iowa and Nebraska, hauling their bushel baskets to Washington and filling them with tax dollars every time the weather’s a little too dry or a little too wet. And their Ron-Paul-groupie farmer friends in Louisiana, selling their farmed fish to the US government at well-above-market rate every time the price of tilapia dips. He’s talking about that Iraqi war vet in Mississippi, the guy with one arm, half a leg, and a NObama, Keep the Change bumper sticker on the car he’s using to drive into town to cash his “disability” check. Oh, and the Iraqi war vet’s buddy, that guy at defense contractor Lockheed Martin who keeps selling us $250 million F-22 fighter planes that weren’t used in either the Iraqi or Afghan wars, because they don’t work and never will work. He’s talking about all those unwed mothers in Alabama and West Virginia, with their scary-high obesity rates and seventh-grade educations, dropping their kids off at government-subsidized daycare centers before going off to work another day, making $7.15 an hour shrink-wrapping chicken breasts at Tyson instead of staying home like Ann Romney and baking pies. Freeloaders, every one of them, and Mitt Romney is on the case. The numbers tell the story, as Romney, former governor of blue-state Massachusetts, knows all too well. For every dollar that a resident of New Jersey pays in taxes, he gets back 61 cents in federal benefits. (Hey, we’re #1 in the nation in the category of Getting Nothing For Our Taxes!) Connecticut? 69 cents. California? 78 cents. New York, that pinko Communist haven of Cadillac-driving welfare queens? 79 cents. Massachusetts? 82 cents. And then, of course, you’ve got your takers, hopelessly devoid of pride or ambition, slaves to government handouts, living off the toil of others with a true work ethic. Come on out and take a bow, Mississippi ($2.02 for every $1). And come on down, Louisiana ($1.78), West Virginia ($1.76), Alabama ($1.66), North ($1.68) and South ($1.53) Dakota. You get the picture. It’s all here in the map, if you want to take a look. We’re in dire straits here in New Jersey, plagued by moochers and deadbeats on every side, but Mitt Romney is riding to our rescue. Mitt Romney knows who his real friends are, and they’re right here in New Jersey, in New York, in California and Connecticut. 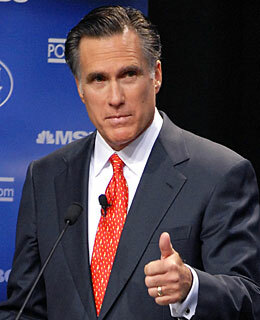 Ladies and gentlemen, I give you the next president of the United States, Mitt Romney! This entry was posted in Diatribes and tagged Deadbeats, Election 2012, GOP, Mitt Romney, Moochers, Red State Politics, Republican Party, Taxes by Harry Ramble. Bookmark the permalink.